February was an excellent month, as our portfolio value increased by 10.63%. Year-to-date, we're up 21.98%. The stock market rally continued during February. Our portfolio is well on track to meet the goals I outlined at the beginning of this year. I will also highlight one of my Belgian gems that reported its annual results last Friday. 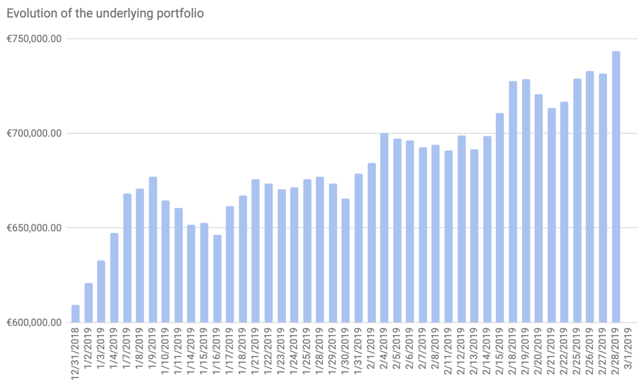 My portfolio consisting of covered-call writing positions (54%) and buy and hold positions (46%) had another great month in February as the overall market sentiment remained bullish. To me, the amount of control and flexibility that you have with covered-call writing will be crucial to maximize my profits heading into a new trading month. As conservative investors for whom capital preservation is of key importance, we have to make a firm market assessment and dissect every aspect of our one-month strategy. Furthermore, when you have (and should have) exit strategies and position management in place, your returns can be improved even more. Essentially, those skills will set you apart from other covered call writers. To learn more about the basics of covered-call writing, read my recent blog post. Besides addressing my covered-call writing strategy, I will also look at the lessons learned and one of my Belgian gems that reported its annual results last Friday. First of all, the economic data have been pretty mixed lately with ISM indices coming in at still healthy levels (the manufacturing index stands at 54.2) and retail sales declining sharply. Obviously, today's economic environment puts the Fed in an embarrassing position. Since the S&P-500 has recovered most of its losses seen in 2018 over the past several weeks, the most interesting index to look at remains the VIX which usually has an inverse relationship with the S&P 500. As you can see from the graph below, the VIX is now notably lower than the levels we've seen over the past 50 days indicating some turbulent weeks might be in front of us. The inverse relationship between the VIX and the S&P 500 is not 100% accurate but it will add information that will help guide us in our covered-call writing decisions such as stock selection and strike price selection. 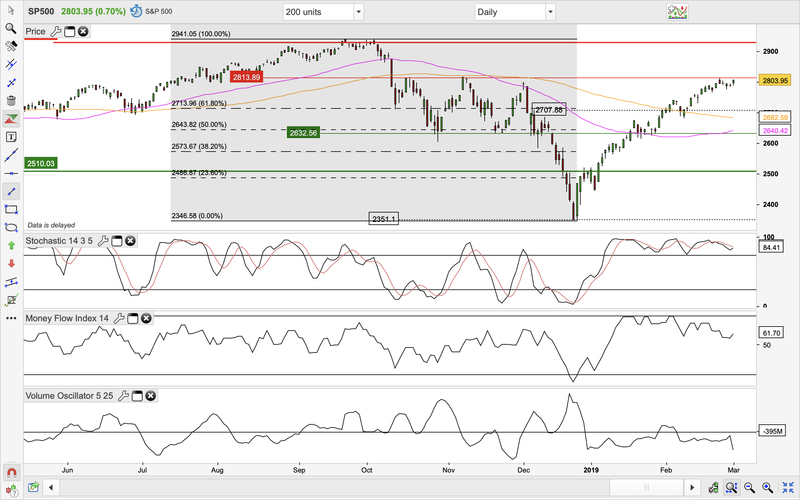 Looking at technical analysis and more specifically at oscillators will lead us to the best selections. Below, I've inserted the charts of the S&P 500 (SPY), the Dow Jones (DIA) and the Nasdaq (QQQ). In addition to traditional resistance and support levels, we'll take a closer look at the Fibonacci retracements, Stochastic Oscillator, Money Flow Index and Volume Oscillator to evaluate today's technical conditions. 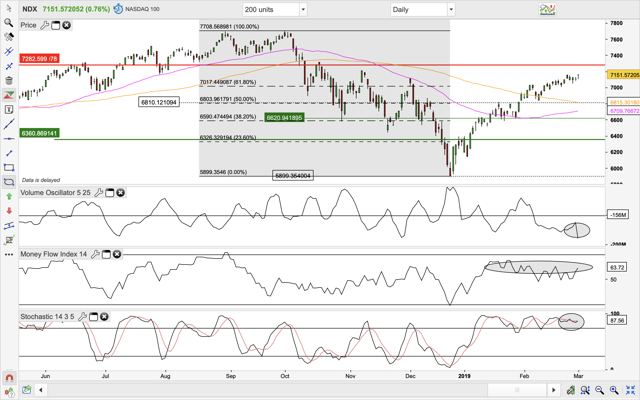 Technical analysis is very useful if one can notice a divergence between what the chart is telling you and what the leading indicators are showing you. Today, I've become more concerned about the broader market as the strength of the rebound seems to weaken a lot. 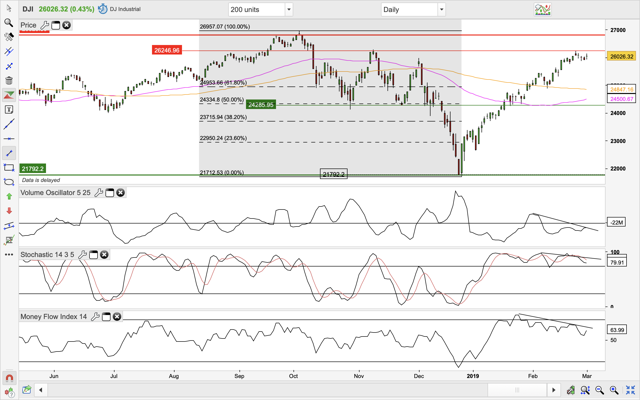 There are various reasons to assume that some cooling-down is underway as the Stochastic Oscillator is in overbought territory, but more importantly, the Money Flow Index and the Volume Oscillator don't confirm bullish sentiment anymore. 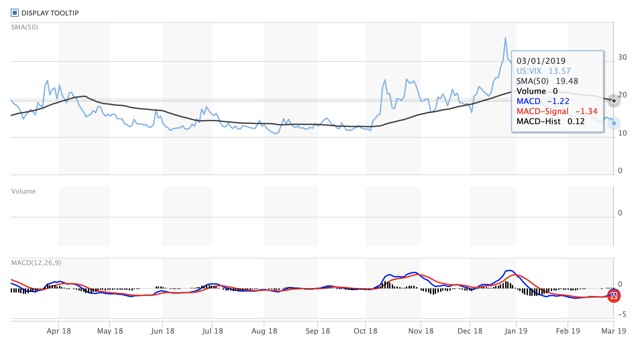 When looking at the chart technicals and the VIX, I believe that investors should be aware that today's bullish sentiment isn't confirmed anymore. 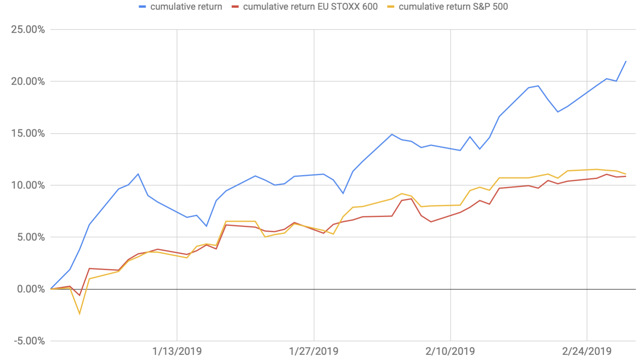 Whereas I focused on higher-than-average volatile stocks and out-of-the-money calls in February, I'm now looking for more safety via in-the-money calls. As mentioned in my January review, I recommended you to roll down on AT&T. When instituting this exit strategy, you actually create a second income stream with the same shares in the same month by giving up upside potential since you lowered the agreed upon sales price. Over the past month, I've actually learned one very important lesson when it comes to strike price selection. 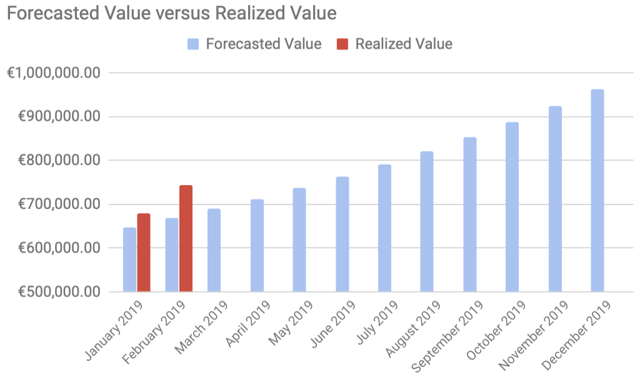 When we've established the list of underlying securities that we are going to use in a particular trading month, we always have to be aware of the calculations and the returns that our trade setups are likely going to generate. If we've maxed out our trade, we shouldn't feel bad if the price went above the strike price by so much. Basically, in return for a nice options premium, covered-call writers remain capped on the upside. In February, I had to roll out several options contracts in order to avoid assignment because the underlying securities still met my requirements. When rolling out an options contract, some of my clients look in the rearview mirror to see what would have happened if they didn't sell the option. When your strategy is covered-call writing, you have to know that your upside potential is limited by the strike price that you determined. That's maybe the biggest booby trap that every retail investor who wants to start selling options should factor in: greed if the price shoots through the roof and you are obligated to sell your shares at the strike price. And for me, February was the month I had to put that emotion away because I still generated beautiful returns. Although I expected a much bigger dividend increase to at least €2.90, management does an excellent job in chasing after new projects and therefore they need the cash immediately. During 2018, VGP grew its total investment portfolio from €1.563 billion to €1.936 billion including its 50% stake in the joint venture with Allianz Real Estate. As you can see from the circular diagram, Germany contributes the biggest chunk of VGP's rental income. Since VGP acquired a lot of new land banks, rental income increased sharply to €104.1 million with a rock-solid occupancy rate of 99.3% for the completed portfolio. Consequently, as CEO Jan Van Geet addressed in the conference call, VGP is very well positioned to follow its growth path heading into 2019. VGP now offers customized solutions for over 200 tenants with an average lease duration of 7.2 years. The fact that VGP is looking to expand its collaboration with Allianz Real Estate surprised me the most. Currently, VGP and Allianz already have a Joint Venture with a targeted portfolio value of €1.7 billion. As communicated in the conference call, the talks will be completed at the end of the first quarter, which means that the second Joint Venture will be operating very soon. This will be another driving force for VGP to recycle its capital employed and to develop new projects. E-commerce is expected to continuously fuel demand for lettable space and incessant lease growth. Since the beginning of the year, my parents and I have decided to combine our portfolios to facilitate monitoring of our positions. Today, 46% of our investment capital is deployed on pure buy and hold investing, while the remaining part is allocated exclusively to monthly covered-call setups with the possibility that our shares can get called away from us (the list of securities in this real-life portfolio is shared with premium members of my website). 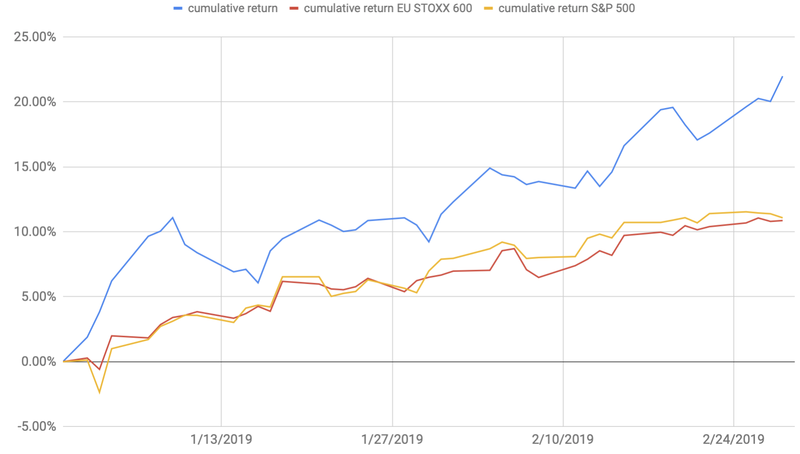 Year-to-date we're up by 21.98%, which is far ahead of our two major benchmarks (S&P 500 and the EuroStoxx 600). February added another 10.63% to our investment portfolio compared to the beginning of this year. Net option premiums received amounted to €17,484.6. I had to roll out several options contracts, and so far, those actions have turned out to be excellent. My Belgian brokerage account, which is used for option selling only, registered my return as follows (including the value of the contracts sold). Other trade setups shared with premium members of my website are also well on track to generate one-month returns of, on average, 3.9%. That figure is at the upper end of my targeted 2-4% goal. Total downside risk protection amounts to 8.8%, which is a perfect cushion that will help us cope with the next market correction. More importantly, we had the opportunity to unwind positions faster than initially anticipated, thereby generating a second income stream in the same options cycle. 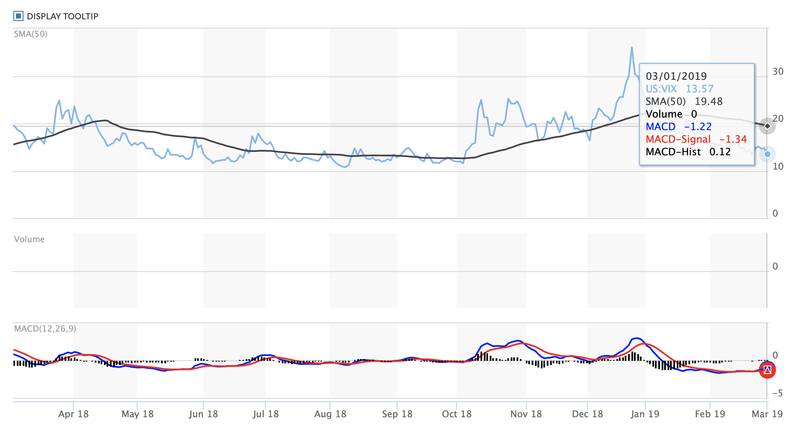 The realized profits of my model covered-call trade setups highlighted here on Seeking Alpha amounted to an average return of 4.44% (or an annualized 69.03%). 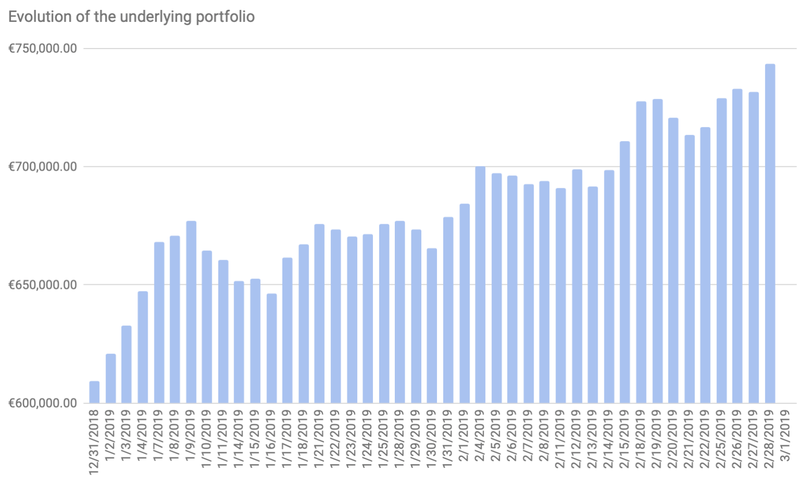 Since the beginning of the year, my parents and I have combined our portfolios to facilitate monitoring of our positions. So far this year, our portfolio value rose from €609,427 to €743,383 thereby exceeding my already ambitious target of €667,250. This has only been possible by selecting the right stocks, the most appropriate strike prices, and a whole series of exit strategies allowing us to lift our profits to the highest possible level. Right now, the technical conditions indicate that some cooling-down might be in front of us. That's why I'm currently preferring the in-the-money calls to get some cushion of my profit. In the buy and hold segment, VGP, currently the company I've allocated the most money to, reported excellent results. I feel the shares are still way undervalued and I'm looking to add even more. So all in all, I'm looking forward to navigating our portfolio through the next period and continuing to generate reliable and growing income streams. Disclosure: I am/we are long VGP. I wrote this article myself, and it expresses my own opinions. I am not receiving compensation for it (other than from Seeking Alpha). I have no business relationship with any company whose stock is mentioned in this article.